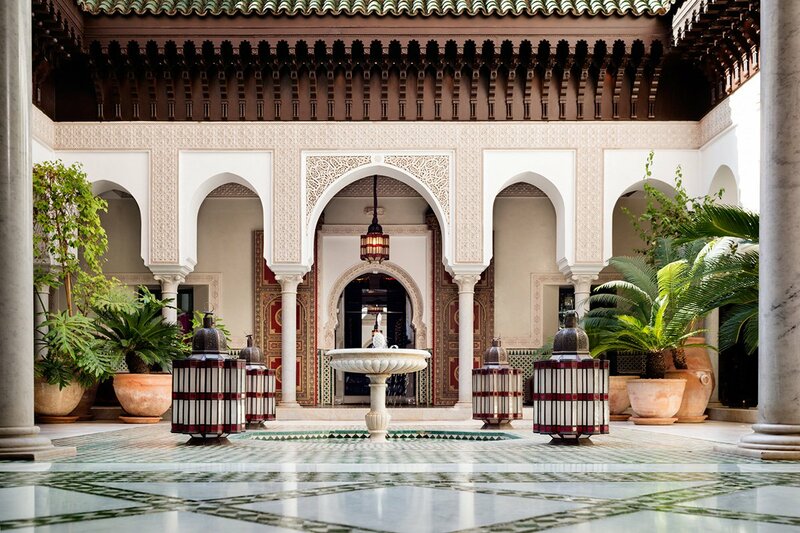 Welcome to La Mamounia. 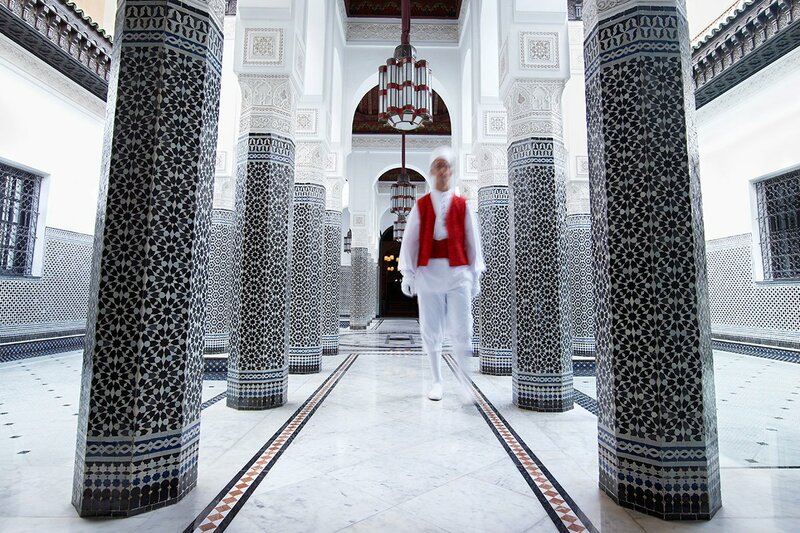 All photos courtesy of La Mamounia. 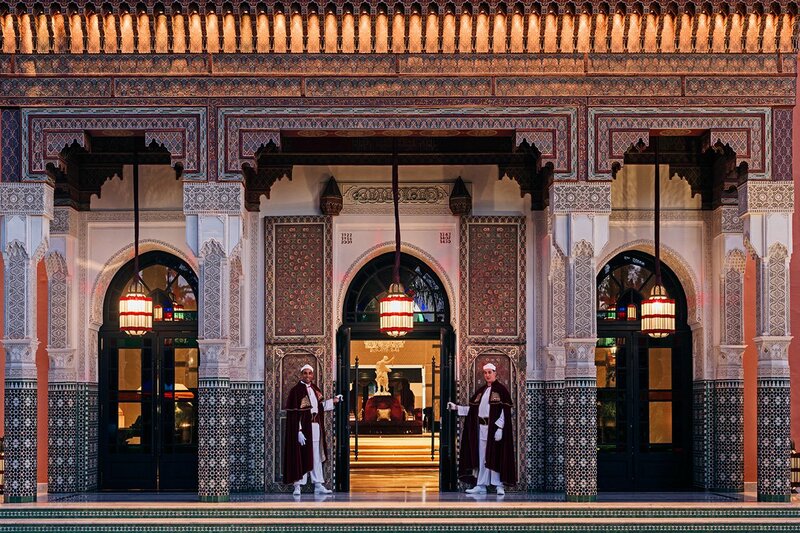 MARRAKECH – My first glimpse of the legendary hotel La Mamounia will forever feel like a scene stolen from a movie. Sun-blanched sky, dusty medina walls, and a pale-pink palace revealed through iron arches. My trip to Marrakech unfolded right around the time that Wes Anderson's arrived in theaters, and though I didn't see the film until I was back in New York, I was struck by the Andersonian nature of the place: prestigious and precious, set in a romanticized bygone era, with just the slightest hint of French pop. 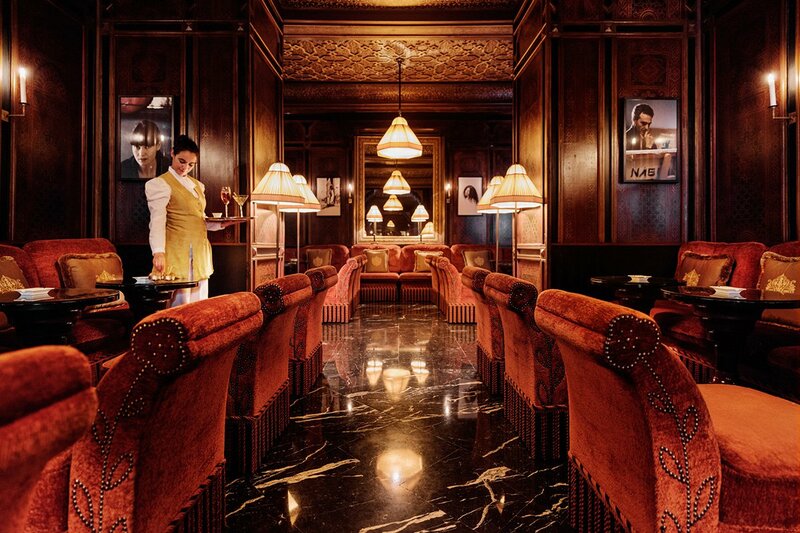 Not unlike a Hollywood movie, the 90-year-old hotel's 21st-century refurbishment is the ultimate example of what French hotel designer Jacques Garcia, hundreds of artisans skilled in Arab-Andalusian traditions, and $100 million dollars can do. Picture this: A sprawling estate, at once old world and freshly modern, familiar and exotic, real and surreal. Suspended in its own space-time continuum, where everything (the rays of the sun, the scent of oranges, the ripples on the pool) moves slowly and deliberately. It was low season and a million June degrees, but it was still a spectacular kind of deliberateness. I found small joys in the even smaller details. Upon arrival: hand towels, fresh dates, rose-scented almond milk. A glance around the main hall revealed sculpted wood ceilings, latticework, leatherwork, metalwork, and terracotta mosaics. 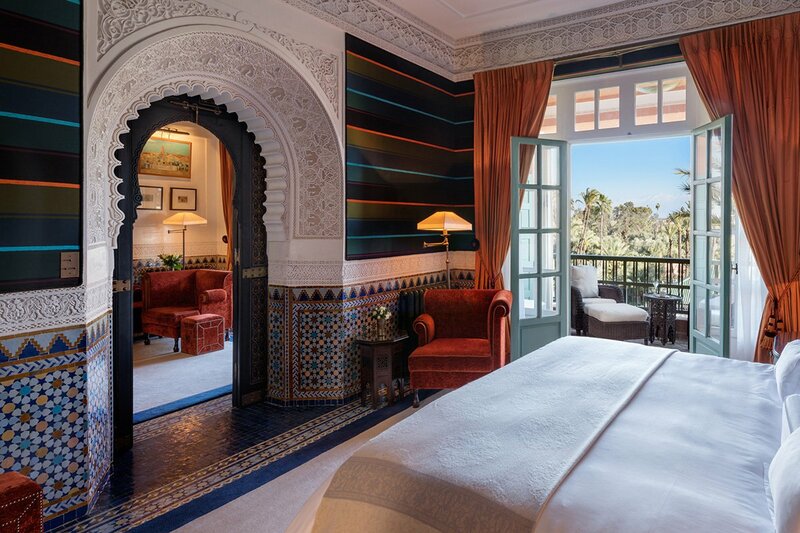 I almost cried the first time I walked into my room because it was the real-life equivalent of the Moroccan fantasy I had built up in my mind. It was a Berber jewel box, and I had the key — at least for a few days. I lounged on the velvet sofa, bathed in the claw-foot tub, studied the Mesopotamian stucco work, and plucked perfect stone fruits from the polished silver tray on my coffee table. When I threw open the balcony doors, I looked down onto centuries-old olive trees, Barbary figs, geraniums, banana palms, flowering cacti, and a mile of manicured roses. There are nearly twenty acres of park grounds, with people tending to them at all times, perfuming daydreams with bougainvillea, amaranth, and Madagascar periwinkles. I saw the chef of picking aromatic herbs in the vegetable garden. The in-house Italian restaurant is an offshoot of on the Amalfi Coast, another Popupla favorite, which made the experience a dream within a dream. I saw a donkey pulling a cart of produce for , the courtyard restaurant where I tried a dozen mezze plates and got hooked on Moroccan rosé and the strumming of the oud. Beyond the garden's walkways, I peeked into riads with their own private pools and mosaic courtyards. In the afternoons, when it was too hot to haggle at the souk, I roamed the orange grove and tree-canopied path to the hotel's freestanding patisserie, , where it always felt like the perfect time for a French macaron and cup of cinnamon ice cream. And I didn't even mention the hotel staff uniforms! Everyone — from the gardener to the housekeeper to the expediter to the bellhop — wears chic, starched, all-white outfits accessorized with capes, collars, and caps. 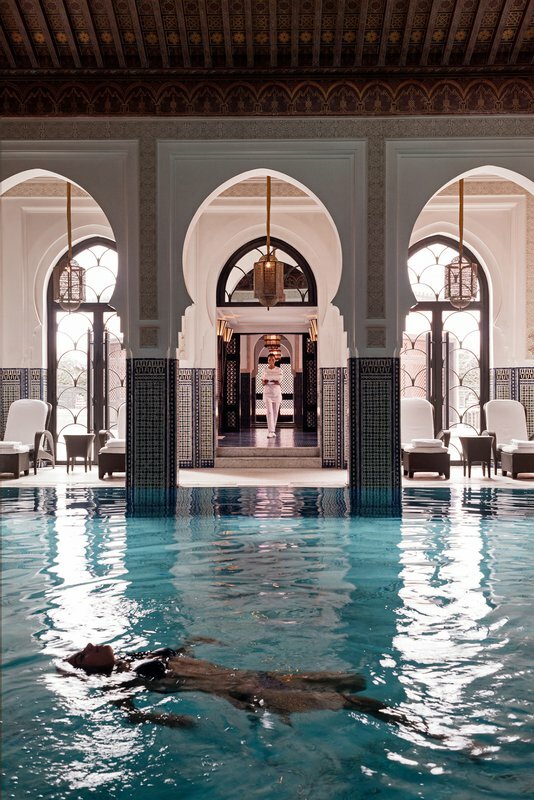 I tried to commit every careful detail to memory: the colored glass lanterns in the walkways, the arched columns of the spa's hammam, the slickness of argan oil, the tasseled towels laid over the poolside lounge chairs. For weeks after I returned home, I kept my suitcase zipped and would only open it to get a waft of atlas cedar, rosewood, lemon tree, and sweet orange — the hotel's signature fragrance — to let the experience linger long after I unpacked. Rates change seasonally and typically start at $730. . Or get in touch with the Popupla Travel Desk and we can plan your trip for you.